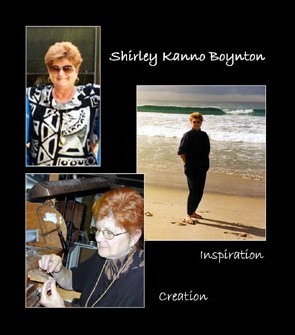 Shirley Kanno Boynton brings the meaning of "Aloha" into her jewelry designs. Her creations are inspired from within the soul, stemming in part from the 25 years spent in the Hawaiian Islands and a love of the ocean, culture and lifestyles of all humanity. A Masters degree in Art and credentials in the teaching of Art and Vocational Jewelry Design and Fabrication enhance her creative abilities. The first part of her career was spent as a teacher and professional artist with numerous exhibitions and awards in painting, design and education. Expanding on the need to create led to the formation of a vocational jewelry program on the secondary school level in California. Many individuals are professional artists and jewelers as a result of this training. After moving to the Islands, Shirley opened her first gallery and earned her many awards in jewelry design and community involvement. The goal of the gallery was to educate the client on truly unique custom one of a kind jewelry and art. Listen to the client and design a wearable work of art that expresses their personality and style. The creative process is about communication between the client and designer. The client's individual taste and flair combined with the designer's ability and expertise to interpret these into wearable works of art produce truly unique designs. A need to be close to family meant relocating to the San Diego area and the opening of Artisan Collection in Hillcrest. Shirley still visits the Islands and meets with her many clients there, which provides inspiration in Shirley's current creations. The Hillcrest area is truly unique with numerous visitors from around the world. This has provided Shirley with the opportunity to share her designs and be inspired by many influences for creative expression. These combined with 40 years in the jewelry and art business insures professional commitment with creative expression. Shirley's not only an artist and designer/goldsmith sensitive to her client's needs, but a gallery owner that supports local artists with a showcase for their work. Artisan Collection offers an excellent selection of fine art. The selection includes paintings, ceramics, hand blown glass, sculpture, photography, jewelry and original handmade gift items. When in San Diego, or if you live in the area, take the time to explore and enjoy this intimate gallery tucked away in the center of Hillcrest and avail yourself of the knowledge, experience, enthusiasm and expertise of Shirley's many years as an ARTISAN and the fine local artists she represents.